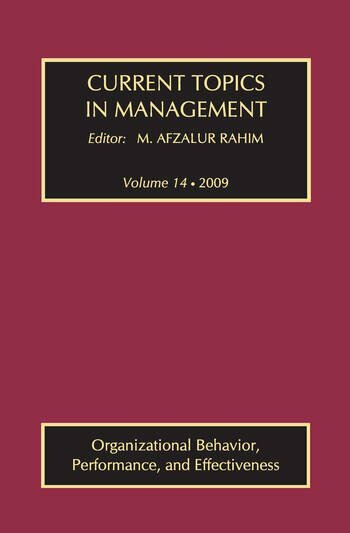 As the series editor, M. Afzalur Rahim points out with justifiable pride, for the past fourteen years Current Topics in Management has provided high quality research and theory on management concerns at the international as well as national levels, and done so through with respect for the universality, collegiality and need for broad involvement. The present volume continues and expands on that tradition, and is predicated on the need for high level interactions between human motivation and organizational performance. While each essay is unique and can stand alone, the volume demonstrates a linkage in four major sections: organizational behavior and performance; strategy, structure, and performance; cognition, common sense, and effectiveness; and entrepreneurship as a whole. This makes possible a unique title for the volume as a whole: Organizational Behavior, Performance, and Effectiveness. This volume takes on innovative dimensions in its own right: the relationship between competence, performance and longevity in issues of social support networks and organizational turnover, the issue of competence destroying technologies that are engulfed by uncertainty, firm performance and cognitive differentiation of tasks, management premises and cellular organizations - both past and present, and wider issues of cognition in the performance of tasks and the design of enterprises. This is in short,i?1/2a cutting edge volume of potential wide use and interest in a variety of public and private managerial situations.